The Zephyr Club Chair features a uniquely modern and sculptural silhouette. The 26” deep seat depth, in combination with the low plush back and tapered arms, make this club chair perfect for both formal and casual seating. 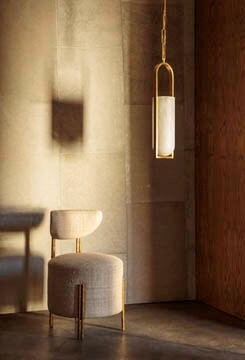 The cast brass legs exhibit a hand applied hammered texture that give the piece architectural details. The hardwood frame is double-doweled with 8-way hand-tied springs for longevity and performance. Available in a selection of curated fabrics and leathers. The Melange Club Chair features loose upholstered seat and back cushions with a micro welt detail and cast brass legs. The delicate legs are composed of dual cast brass cylinders with a rich hand-wrought texture in our signature burnished brass finish. Seat and back cushions feature 10/90 feather down fill. The hardwood frame features double-doweled joinery and is built for longevity. Available in a selection of curated fabrics and leathers.